Movie Reviews - 'Cloud Atlas' - 'Cloud Atlas' Is A Film In Need Of A Road Map David Mitchell's exquisite novel Cloud Atlas has been adapted for the screen by the Wachowskis and Tom Tykwer. The film is never dull, but critic David Edelstein found that unlike the book, the film fails in its attempt to tie six distinct stories together. Author David Mitchell writes exquisite pastiches, and Cloud Atlas is in the form of six distinct and enthralling novellas set in six different eras with six different literary styles. First comes the journal of a 19th century lawyer for a slave-trading company, then a series of early 20th century letters from a down-and-out composer who apprentices himself to an elderly musical giant. We jump to a 1970s paranoid conspiracy thriller; then a 2012 tale of a debt-ridden publisher tricked into signing himself into an old age home. In a totalitarian future, a South Korean restaurant is staffed by female robots called "fabricants," a couple of which are beginning to think for themselves with tumultuous social consequences. The last story is set in a post-apocalyptic future in which some denizens are hunter-gatherers, others cannibals. From story to story there are echoes, counterpoints, variations, characters in one time aware of characters in the previous one through print or film or oral history, so it's as if a baton is being passed. The idea that everything in the universe is connected doesn't come from a character's speech — it seeps into you as you read. 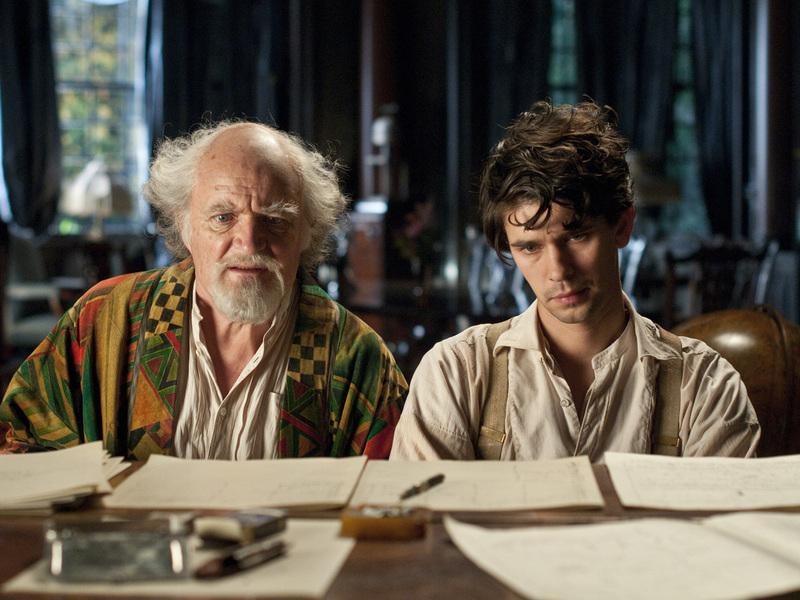 Jim Broadbent and Ben Wishaw, seen here as Ayrs and Frobisher, also play five roles each. Both put forth stellar performances. The movie, directed by Andy and Lana Wachowski and Tom Twyker, doesn't have discrete episodes. Every one of its stories is interwoven with every other — it's an epic hash of crisscrossing fragments tied together by music in a vain attempt at fluidity. I found it disjointed, distractingly busy; unlike the book, it telegraphs the theme from its first scene on. The main actors have parts in all six stories, often in egregious disguises. They're a very uneven stock company. Tom Hanks speaking in a subliterate patois opens the film as a post-apocalyptic tribesman, then shows up with a putty nose and snaggle teeth in the 19th century — and so on. I like Hanks but when it comes to transforming, he's no Peter Sellers. It's always, "Hi, Tom!" The even less versatile Halle Berry is primarily a gossip-rag reporter who ferrets out chicanery in the nuclear industry. Hugo Weaving plays sundry one-dimensional villains while Hugh Grant manages to embody a cannibal in war paint without losing his English lockjaw. Korean Doona Bae is the "fabricant": She has a lollipop head and a lithe body, but it's hard to detect much under the surface. There is one fine performance — Jim Broadbent as the publisher, and one splendid one — Ben Whishaw as the young composer. But the dialogue is full of flashcards and placards. Hanks gets to sum the film up in the episode in which he's a nervous nuclear scientist with blond hair in love with Berry's reporter. Cloud Atlas is never dull; it's like a series of clunky but energetic B-movies inflated by lines like "Separation is an illusion" and "My life exists far beyond the limitations of me." It's certainly passionate. You can see why the Wachowskis were drawn to the book. They've expressed a belief in the transmigration of souls, the body but a weak and temporary vessel. And politically, they're radical: For them, every age has oppressors with unchecked power who preserve artificial boundaries — racial, sexual, economic, spiritual. As in The Matrix, the answer in Cloud Atlas is: Free your mind. Once you do there is but one possibility: Overthrow the Man. My own mind was too dismayed by all the howlers in the dialogue and acting to be freed — the movie is too literal-minded to be a good head-trip. But I should add that audiences at the Toronto Film Festival premiere reportedly stood and cheered for 10 minutes. With its busy transitions and metaphysical heft Cloud Atlas could be this year's Inception. You'll travel farther, though, if you read the book.